This is a delicious recipe that adds the nutrition and taste of oat bran to a wonderful blueberry muffin recipe. 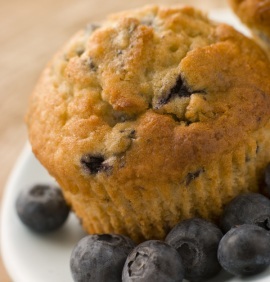 These muffins are not just a treat, they are amazingly nutritious too. 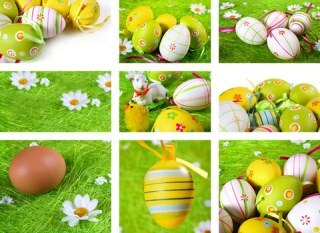 I think you will really enjoy them. 1 cup blueberries, fresh or frozen. If using frozen blueberries, make sure they are completely thawed and well drained. Combine oats and buttermilk or sour milk in a bowl. Let stand. Combine flour, baking powder, baking soda, salt and brown sugar in a larger bowl. Stir to mix well. Add egg and melted butter to oat and milk mixture. Add this mixture to the dry ingredients. Stir only until all ingredients are moistened. Carefully fold in blueberries, stirring only to distribute them evenly through the mixture. Fill 12 muffin cups 3/4 full and bake at 400°F for 15-22 minutes or until a toothpick inserted into the center of a muffin comes out clean. The secret to great tender muffins is to mix the dry ingredients and the wet ingredients well separately, but once you put the wet ingredients into the dry, stir to mix just until the dry ingredients are moistened. Over mixing will give you a heavier, less tender muffin. Omit the blueberries and add 1 medium apple, peeled and chopped, plus 1/2 teaspoon of cinnamon to turn this treat into a delicious oat bran apple muffin recipe. To make this oat bran blueberry muffin recipe into apricot oat muffins, omit the blueberries and add 1 cup of chopped dried apricots. Soften in warm water before adding to the mix for added tenderness. To make sour milk put 1 tablespoon of lemon juice into a 1 cup measure. Fill cup with milk. Let sit for a few minutes to sour while you assemble the rest of the ingredients. 1. Use whole wheat flour instead of white flour. I always recommend sifting whole wheat flour before you use it in baking because it lightens it up. It works perfectly in the recipe thought, adds nutrition and still tastes great. 2. Add some nuts. 2/3 cup of walnuts to this recipe. You will love the crunch and walnuts are SO healthy. The oat bran and blueberries are two of our healthiest foods. These muffins are not super low carb but they are still healthy for most diabetics. The oats and oat bran are great for fiber. I would just lower the sugar content a bit or replace the sugar with an equivalent amount (not equal as sugar replacements are much sweeter than actual sugar) of stevia or even Splenda. 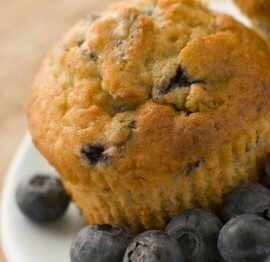 You will find our other delicious recipe for blueberry muffins here. They just came out of the oven. Delicious. Next time I would go a bit easier on the salt/baking soda. I seem to find them a bit on the salty side but they are still very good. There was no mention in the instructions when to add the oat bran. So I just tossed it in with the oats and milk.